This book celebrates the 60 years of motor racing glory and technological evolution of Maserati, one of Italy's and the world's greatest car manufacturers. It describes the extraordinary adventure of the racing cars that carried the famous Trident in almost all disciplines of the automotive sport, from Formula One to sports car racing. Immortal single-seaters like the 6CM of the Thirties, the 1957 Formula One world championship-winning 250F and the 420M "Eldorado" are described here with a wealth of technical detail and spectacular colour pictures. 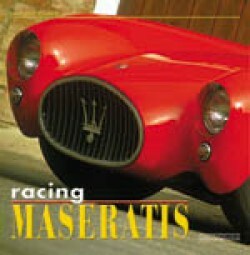 There are ample sections dedicated to Maserati sports racers, which enabled the Modena manufacturer to excel on the circuits of the world: a far-reaching dynasty of models, from the A6G.CS "Monofaro" or "Single headlamp" to the A6GCS of the Fifties and the Pininfarina coupé version, which was one of the most brilliant examples of post-war Italian car design. And there is no lack of the celebrated barchettas, with which Maserati wrote such a glorious chapter in the story of world motor sport: cars like the 150S, 200S/SI, 300S and the legendary Tipo 61 "Birdcage" - one of the most audacious and futuristic sports cars ever built - right up to the Barchetta of the Nineties. Rare vintage photographs, detailed technical specifications and exhaustive lists of chassis and engine numbers complete this work, which is not only for Maserati enthusiasts but for all racing car lovers.